Very beautiful photo. I bet it is amazing. You've already conquered more than 1/4 of Oregon! buy penny stocks raises a good point. 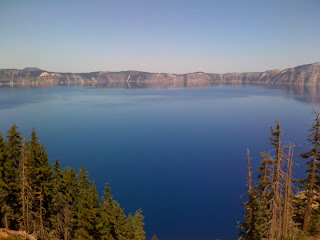 We've been to Crater Lake more than once. Gorgeous! What I most remember, however, is standing on the rim with David, who was about 4, and thinking, "If he were to stumble and fall, there's no barrier in sight which would keep him from hurtling straight into that gorgeous lake." So we high-tailed it back to the lodge. Which is one reason he turned 18 yesterday. As for you guys, rock on! GO GO GO Steve and Jane ... we are proud of you and your fantastic progress ... only a state and a half to go. You guys are amazing!